A family say they will fight an order to get rid of their pet hamster and budgies - along with their two snakes and iguana - from their council home in Llanelli. 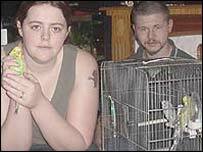 As well as having to find homes for their reptiles, Mal and Alexia Rees have been told Fluffy their hamster and their four budgies also break tenancy rules. They say Carmarthenshire Council is being heavy-handed and will try to fight the eviction. But the authority says its rules clearly state that tenants are allowed one cat and one dog as pets but nothing else. Mr Rees claims he spoke to the authority more than two years ago before buying his first snake and was told it would not be a problem. He keeps a royal python called Nadia and a Columbian rainbow boa Bill under lock and key in a tank in the living room and an iguana in a tank in a bedroom. On Monday three housing officers visited the Rees' home in Penyfan saying they were doing a routine check. They went into every room, including the attic, and then said all the pets had to go. "They decided that we had to get rid of them all - including the budgies and the hamster," he said. "But a hamster and budgie - I don't even know if they could draw blood. I feel angry about it. "I got bitten by a dog when I was four - I don't know how many stitches I had to stitch my ear back on. I have never had a nasty accident with a snake." 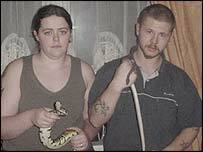 Mrs Rees said: "The kids are devastated - they don't want to get rid of the budgies, the hamster or the snakes. "To us they are pets - we keep them as pets and they are handled well. But she said the family did not want to lose their home over the issue. "It's upsetting because we don't want to get rid of any of them but if it comes to eviction we don't have any choice." Carmarthenshire's housing services manager Robin Staines said tenants must tell the authority if they intend keeping anything other than a cat or dog. If Mr and Mrs Rees wanted to discuss the matter, they should contact him to see if a compromise could be reached.